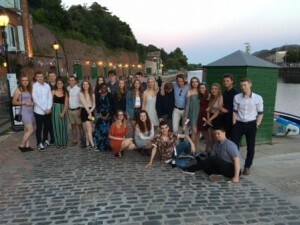 Yesterday evening Year 13s enjoyed their alternative ‘prom’ dinner at ‘On the Waterfront’ on Exeter’s Quay. They were joined by subject teachers and the Post 16 team and it was a great opportunity to celebrate the end of their exams. It was a brilliant evening and all involved had a great time. We wish the Class of 2018 all the best for their future endeavours and look forward to seeing them again on Results Day!